When Invisible, Inc. debuted on PC last year, I thoroughly enjoyed it while realizing that its particular brand of “tough but fair” gameplay — a cold, calculated blend of tactical role-playing, stealth espionage and roguelike — was simply not for me. And believe me, I’m not against this sort of thing in the first place; I’ve recently found myself a huge fan of the brutally beautiful Souls series. And since I’ve become so in love with repeatedly dying in From Software’s formidable franchise, I find myself equally sure that, for a certain brand of gamer, suffering repeated failures in the PS4 version of Klei Entertainment’s unforgiving and cerebral indie will be a dream come true. 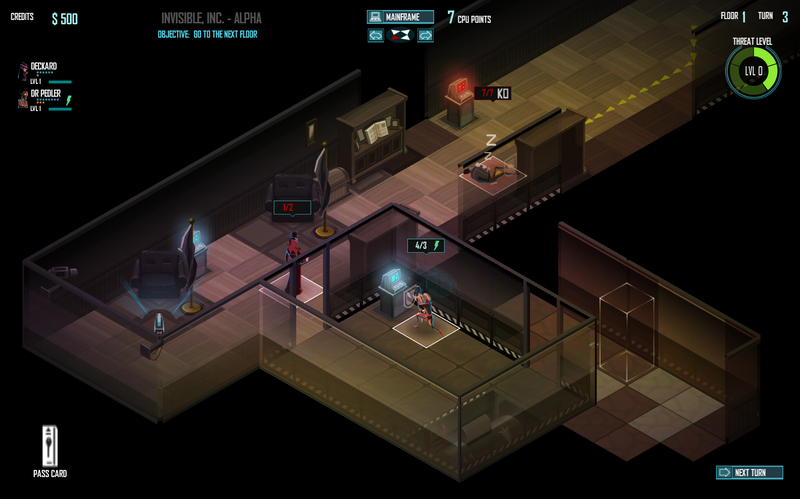 After all, a victory barely snatched from the jaws of defeat is exactly the sort of thing that makes games like Invisible, Inc. Console Edition so satisfying in the first place. Given the impressive style and spectacle of the game’s opening cutscene, I was originally surprised to find it didn’t have much of an emphasis on narrative. Yes, there are plenty of characters — most notably Central, the always-present voice in your ear that for some reason reminded me of The Chief in the Carmen Sandiego games (and I mean that in a good way; perhaps I just lack points of comparison in this area). And sure, you’ve got a bunch of agents to take out into the field, each lovingly rendered in amazing pixel art with their own skills and quirks. But when you really get down to it, the main attraction here is the elegant nastiness of the campaign itself, which leaves the dialogue and character interaction to a few quips in between missions. It’s not really a bad thing, but since the game got me interested in the cyberpunk world and the people inhabiting it, I did sort of wish there were more to know about them. Oh well, though. 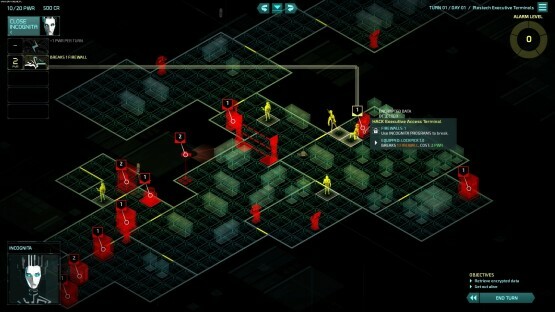 Once you see what Invisible, Inc. Console Edition has to offer in the gameplay department, you realize that a focus on narrative would necessitate a fundamental change in the mechanics. This is a brief, tense little thrill ride that was built for multiple playthroughs. After setting up some parameters and making you way through a brief tutorial, you’re thrust right into a difficult situation. The corporations that run the world have compromised your headquarters, giving you a limited number of hours (72 in the original build, now customizable) to throw together some equipment and a team to take on the final mission. If that sounds like a stressful proposition, it is — especially when you factor in that any agents killed on your missions will suffer permadeath if not rescued. Outside of the optional tutorial mission, the objectives you want to tackle are really up to you. From the world map, you can choose to infiltrate a number of dangerous facilities: corporate vaults that net you boatloads of credits to use for helpful items; detention centers that hold captive agents to bolster your ranks; cybernetics labs, where useful augments can be installed to your agents; and nanofab vestibules, which house digital storefronts with much larger selections than the ones you normally find. Since you’ve only got so much time before you go head-to-head with the corporate Big Bads themselves, it’s obviously important to pick — and complete — missions that give you a better fighting chance. Completing them, though, is a lot easier said than done. Once you’ve picked a facility to infiltrate, the game randomly generates its interior and contents, from the credits and items you can pick up to the guards and security cameras lurking around every corner. Things then play out like a combination stealth game and turn-based strategy RPG. You move your characters on an isometric map, but how much of that map is visible is determined by where they’re located and what actions you’ve taken. For example, you can approach a door, but what’s behind it won’t be visible to you until you peek through or actually open it. As you disperse your agents further and further throughout the facility, the map blooms from a single room into a large and often daunting set of passages and rooms — with corners to duck behind, safes to hack and plenty of obstacles to take down or avoid. 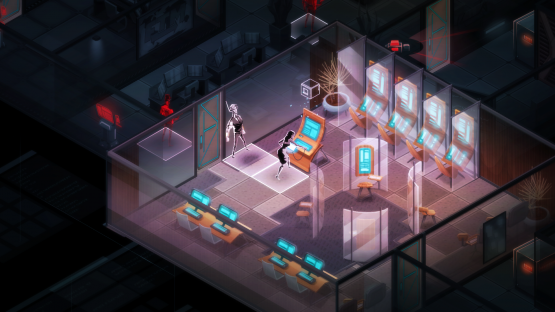 Unless you set your game to the easiest difficulty and turn all the settings to their most forgiving numbers, there’s little hope for success your first time out in Invisible, Inc. Console Edition. There are so many factors to wrap your head around, and so little room for error; in fact, unless you turn on the optional “Rewind” ability when you first set up your game, you’re not even allowed to reverse a single one of the choices you make on one of your agents’ turns. That means if you move to the wrong square by mistake, you’re stuck with that decision and any of the consequences that go along with it. At first, this might sound like it makes for a bit of a miserable time — the game is undeniably unforgiving, and hoping to brute force your way through a war of attrition will only be met with repeated, crushing failures. Then again, there’s something to be said for a game that forces you to take it seriously, and much like any title of this ilk — the famously-tough Souls games included — playing long enough and really making an effort to understand the intricacies will pay off hugely in the end. Unlike some other roguelikes, the random factor here isn’t enough on its own to wreck whatever strategy you’re devising. If something unexpected throws a wrench into your plan, it means there was something wrong with your plan in the first place. And since the game plays fair, and offers so many different routes for you to experiment with and learn from, repeated losses never stop being fun and still feel like progress. I personally don’t have the patience to learn everything there is to be a master of this one, but I know there are plenty of players out there just waiting to build their foolproof strategy. Invisible, Inc. Console Edition looks and sounds great in addition to playing great, too. The characters are depicted with gorgeous, fluidly-animated sprite work that stands up to the best of what AAA publishers can do with pixel art, let alone Klei’s fellow indies. And I was really amazed at the level of detail and realism in the randomly-generated environments, even if their clutter can sometimes make it difficult to tell what’s going on. Great sound design and tense music ensure that the espionage feels just as nerve-wracking as if it were real time (try not to jump at the noise that happens when you’re caught by a guard), and the voice acting is on-point as well. If you’re in the mood for something that will really test your strategy-building chops, Invisible, Inc. Console Edition should be somewhere near the top of your wish list. It’s a tantalizing combination of turn-based tactics and stealth, wrapped up in the shell of an unforgiving roguelike where every single decision matters. If that sounds way too intimidating, don’t worry, you’re in good company — but for the people that enjoy this kind of mind-bending challenge, this is a little slice of cold, cruel heaven that shouldn’t be missed. Invisible, Inc. Console Edition review code provided by publisher. Reviewed on PlayStation 4. For more information on scoring, please read our Review Policy here.